The stroller by Wenzelite has a light weight folding frame with closure strap that holds the chair shut when folded. It has a sleek and attractive black fabric that is machine washable. The stroller has been crash tested for transit and also passed a dynamic crash test done with a 130 lb. front-facing occupant tested at 30 mph. The seat is angle adjustable from 15 deg. and 22 degrees and the back is adjustable from 85 deg., 90 deg., and 95 deg. 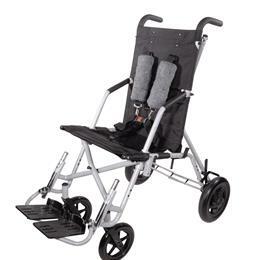 The stroller has 8" front casters and 10" rear wheels with a lock that is able to be toggled. The seat has an adjustable seat depth which allows for more space when needed. The stroller has a positioning pelvic belt and five point "H" harness with padded strap covers for added safety, comfort, and security. The reversible padded strap covers increase comfort and one side of the cover is a soft imitation lamb's wool and the other side is a soft velour. The swing-away footrest are independently adjustable and removable for convenience and travel. Adjustable seat angle - 15 deg. and 22 deg.